Support your friends and loved ones with autism when you wear our bold and unique Autism awareness t-shirt. If we work together, we can solve the complicated puzzle of the autism spectrum. This Puzzle design is printed on our 100% cotton t-shirt, machine washable in youth sizes XS-L & adult sizes S-3XL. Free personalization of any name is included. Additional Info Shop for more of our Autism awareness clothing on MyWalkGear.com. 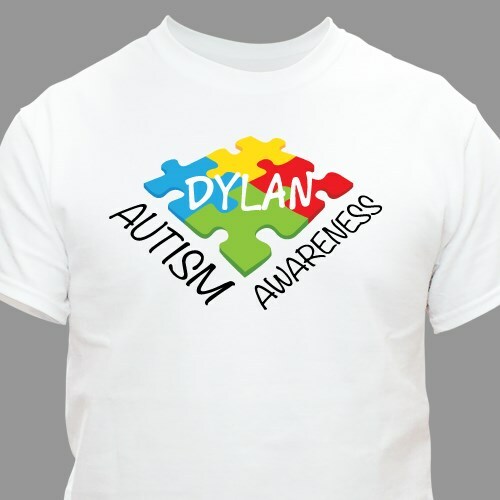 Our variety of designs will help you get your message out to the people around you and educate them about autism. Together, we can make a difference in the fight for autism awareness.